Porcelain veneers are thin layers of a strong porcelain that can be bonded to your teeth to create a whiter, natural-looking surface. 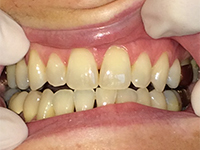 Veneers can improve the size, shape, and color of your teeth and give you the radiant smile you’ve dreamed of. 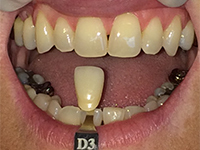 Veneers can be permanent and are typically done in a group over two office visits. You will discuss your goals and learn which option is best for you during a consultation. The cost of porcelain veneers varies case by case, depending on your goals and overall size of the procedure. We’ll provide you with an estimate after your free consultation. Many of our patients have taken advantage of our financing options to help restore their smiles with veneers and other cosmetic procedures. Learn more about financing for cosmetic procedures.